Oz: Broken Kingdom brings a dark twist to L Frank Baum’s beautiful fairy tale. Dorothy and Wizard of Oz have disappeared into thin air and only Ophelia, a stranger in the Land of Oz, can rescue them from the evil witch and her minions. She, along with your favorite Oz characters like the Tin Man, Lion and Scarecrow will have to battle enemies, try and find Dorothy and the wizard and restore peace in Emerald City. You will find it hard to digest that your favorite characters can act in such a deadly and gruesome way when fighting enemies. Oz is a turn-based role-playing game. It lets you collect ability cards which cost mana. You earn mana per turn. Some ability cards cost more mana whereas others cost less. When an ability card is charged, tap it and your hero will act according to the card’s ability. There are offensive, healing and shield cards. Each card also belongs to a unique class. Managing cards and bringing the best hero to battle can help you defeat enemies without much effort. This guide will help you choose the right hero for a campaign level and make the most of each character’s special ability. 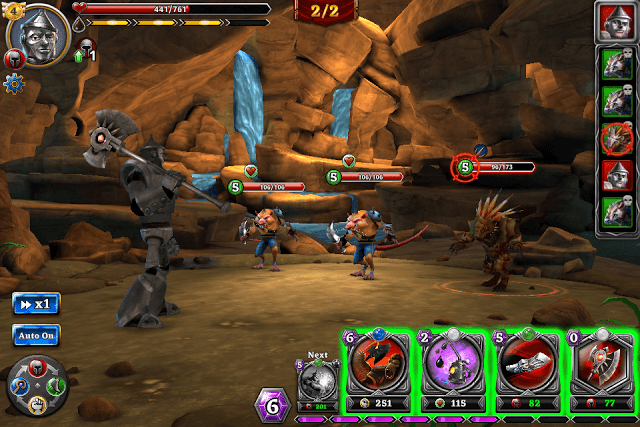 In campaign mode, when you tap a level, a screen pops up showing a list of enemies your hero will confront in battle. Tap each enemy portrait pic to know his class. Make a note of all enemy classes and choose a hero whose card class is stronger than enemy’s class. A hero with a stronger class will get a 10 percent damage bonus against an enemy whose ability is weaker than his. Neither Strength benefits from Armor, nor Armor benefits from Strength, so choosing a hero like Tin Man would be the best bet in battle as his Armor cards will deal additional 10 percent damage to Agility class enemies and he will take normal damage if a enemy belonging to the Strength class attacks him. Remember: Heroes or abilities that don’t benefit from a class deal normal damage. The background color of each hero or enemy also suggests their class. Red – Armor. Bluish – Magic. Green – Agility and Yellowish – Strength. You can change your cards just before each battle once you know what enemies you will be fighting against. Tap the “Edit Loadout” button in the “Choose Your Hero” section and select the best ability cards keeping the enemy’s class in mind. Each hero belongs to a certain class and will possess more cards of that class. However, a hero can also use cards that belong to a different class. Ophelia is an Agility class hero and so she will have more cards of that class, but she also uses Magic cards. Tin Man belongs to Armor class, but also uses Strength cards along with Armor cards. The Lion uses Magic and Strength cards. Heroes that use two separate card classes can be very effective in battle. When you tap a level, you are greeted with the enemy and reward info screen. It also shows the recommended “Might” level. The higher the Might level of your hero, the easier the fight would be. If your hero’s might is higher the recommended might, you can easily win a battle. You can increase your heroes’ might by upgrading his equipped ability cards. Tap the “Abilities” button located at the right side of the screen. Next, select a hero and then tap the equipped card at the bottom of the screen. Remember that a card can be upgraded if you have collected the required number of duplicate cards. A ready-to-be-upgraded card usually has a glow all around it. The glow suggests that it has the required number of duplicate cards. Tap the upgrade button to upgrade that ability card. Once upgraded, your hero’s Might will increase. Upgrading rare cards increase a hero’s might substantially. 1. Ophelia’s “Instinct” bar fills little by little whenever an enemy acts. When full, the ability card located at the extreme right changes color and gives a yellow glow. Use this ability to deal extra damage. It all depends on the card, and with Instinct activated, any card with the yellow glow will have increased stats. The yellow glow around an ability card placed on the extreme right side of the screen remains as long as the instinct bar is full. 2. Tin Man gains “Oil” whenever he gets hit by an enemy. For every hit, a single oil bar fills up. Once all 4 oil bars are filled, they get converted to an extra mana. Mana is required to launch cards, so this bonus mana can surely contribute to the overall mana collected during battle. 3. The Lion gains “Courage” every time he attacks an enemy. When courage bars fill one by one, he gets more powerful and deals more damage to enemies when he hits them. However, he loses one courage bar if an enemy attacks him. 4. Whenever the Scarecrow uses Ability, he gains one “Focus” bar. When his Focus gauge is full, the next attack ability he uses will be supercharged and will deal more damage to enemies. Besides attack cards, each hero should have at least one healing and one shield card. The shield card (blue shield icon) protects your hero from enemy attack for a certain number of turns. Some shield cards also provide extra abilities like “increased critical attack rate for 3 turns”. Healing cards have a heart symbol and can restore full or some portion of your hero’s HP. When a shield or healing card is drawn, use them when your hero’s HP is low. How does one get the scarecrow with the hat? I guess one gets a fancier hat when one evolves the scarecrow.